Having done I a good deal of research on large publishing companies for possible acceptance of my manuscripts, I have learned a lot. For starters, taking that path to publication would mean not reaching goals I have worked toward all these years. I would also have to give up rights to my own work in addition to accepting unfair compensation for my books. After deciding the large publishing houses were not the best fit for me, I looked into self-publishing. I determined quickly it was not my thing, either. Hours turned into days and months of searching for the right outlet for Just Keep Breathing. Because I have other books in the pipeline which are also ready to release this year, I wanted to find a solid publisher – someone established in this business. A fellow author recommended I look into Starry Night Publishing. At long last, my search was over. They offered me exactly what I needed. 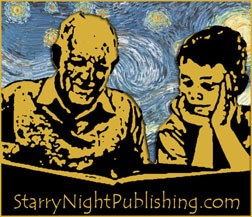 Starry Night Publishing is not about greed. They are about helping good writers succeed as known authors. This company will handle your manuscript with integrity, answer endless questions and publish your book on time. If your manuscript is not ready for publication when submitted, you will be told that up front. In addition to countless perks of publishing with Starry Night, the CEO is genuinely a nice person. Copyright 2015, Jana Brock. All rights reserved. Unauthorized use and/or duplication, copy, rewrite or other use of this material without express and written permission from Jana Brock or Starry Night Publishing, is strictly prohibited. This entry was posted in Jana's Published Writing and tagged publisher, starry_night_publishing, writer. Bookmark the permalink. I have also heard very positive things about Starry Night Publishing, which is quite refreshing amidst all these other self-publishing companies that care more about their wallets than anything else! However, there are a few cynics on the writerbeware website who are a bit leery….I don’t know, maybe some of them have seen too many “scammy” vanity/self-publishing companies and have just decided not to trust them anymore; maybe they just don’t like self-publishing companies (some people just don’t, don’t ask). I think the negative comments that got me were: “I think the reason this company (Starry Night Publishing) has so few bad reviews is that the people (who were scammed by them) are too embarrassed to admit anything….” (Umm, sounds like a Catholic church scandal more than anything),, and “an article where CEO Richard Hartmetz ‘disses” his competitors (Author House, XLIbris, Trafford,, and other Author Solutions-owned companies.) Hello–he wasn’t ‘dissing’ them–he was stating the facts: Those companies and their parent company are scams. I know, I was scammed by Xlibris (along with several thousand others). Is the address he gave me. I am not sure why your email won’t go through but I believe that is his email address. Maybe something to do with the international internet changes?